1969 SCCA B/P sponsor decal ID help needed. I could use some help trying to identify 2 sponsorship decals on the BP AMX. I have been able to identify the other decals on the car, just not these two. This is the only picture I can find that shows these decals somewhat clearly. I have looked at many other race cars from the time period and on ebay under vintage decals, with no luck. These decals do not appear on the Trans Am Javelins either. The decals I do know of so far are: Goodyear, Monroe, Champion, DA Oil, and Union 76. I am not sure who built their engines. I know that some stuff was shared with the Trans Am team. I am building a tribute of this AMX as pictured, so I want to try and get the details correct. Re: 1969 SCCA B/P sponsor decal ID help needed. At what race was this picture taken? I'm not sure, but I think its Daytona in Nov, at the end of the season. I apologize for the poor clarity, I haven't found a better picture yet. Update: I have figured out one of them! The triangular one is a Federal Mogul decal! The rhino outline was the key. 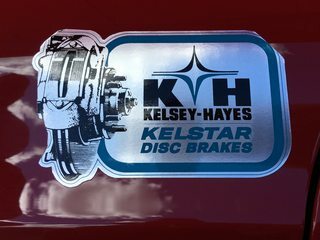 Could it possibly be a Kelsey Hayes Brake decal? BTW, I wonder what make of car that decal is on? EDIT: Most likely it is on the Bud Moore 1969 Boss 302, which pretty much confirms that would be the missing decal!! That's terrific that you got the help you needed. What is the decal at the far back of the car? Possibly a Pure Oil decal? Hey lets see a pic of your BP AMX. Like to see how close it looks to the photos. Do you have a good shop that you use to get decals reproduced? Here is my tribute. I have a complete front and rear suspension that will go in it this winter, along with a cage. I also have the correct front spoiler and steel bumper that will be painted to match the picture. I do not have any place to make the decals yet. I may have the files vectored and then take them locally. I have been lucky so far and will only need the D A Oil ones reproduced in a larger size. The decal on the back of the car is a "UNION76" decal, which I have found. The kelsey hayes was the last one.